The combination of rice and beans is a staple in many cultures, for many good reasons. Whether served as a side dish or entree, the combined nutritional impact plus low cost of rice and beans together add up to its frequent appearance on tables in nearly every type of household. The U.S. Dry Bean Council says that the many varieties of beans are similar in nutritional composition. They contain a wealth of minerals, calcium, iron, and fiber-- so much so that the Dietary Guidelines Advisory Committee Report recommends three cups of legumes each week in order to keep up with their recommendations. Many non-meat-eaters use beans as a protein source since, as the U.S. Dry Bean Council states, a half cup of cooked beans provides up to 16 percent of the recommended daily value. 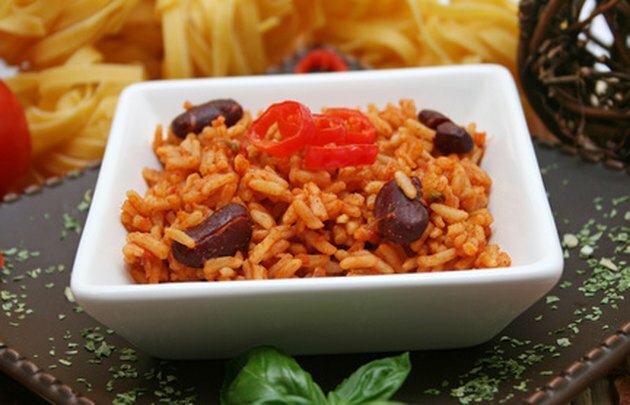 Rice and beans together represent the grain and vegetables groups, according to MyFood-a-pedia, which goes on to describe that one half-cup serving has about 196 total calories, with 45 of those calories being from solid fats and sugars. One of the primary reasons for the commonality of beans and rice, beyond good taste and being filling, is the low cost of both foods. Depending on location, type, and brand, a pound of rice can be purchased for anywhere from $1.00 to $5.00, and a pound of dry beans usually runs for less than $1.00. Canned beans range in price from $0.50 (for 15 oz.) to $2.00, again depending on variety. Every cook, no matter the experience or skill level, can find enough variations on the bean-and-rice theme to make even daily consumption enjoyable. What you think of when you hear "rice and beans" depends on where you grew up and where you live now. In the American South, a creole flavor is often predominant, and red or kidney beans are often combined with white rice. The Southwest states have a distinctly Mexican border influence, so pinto beans are more typical fare. Black beans, too, are used often in the South and western states, a tradition carried up from the Yucatan peninsula. Beans are available canned, dry, and sometimes fresh, virtually year-round everywhere. Since they're a traditional source of inexpensive protein, even grocers in the least populated areas keep beans on the shelf. Rice is similar, though consumers will find that available types can be less varied outside of metropolitan areas.